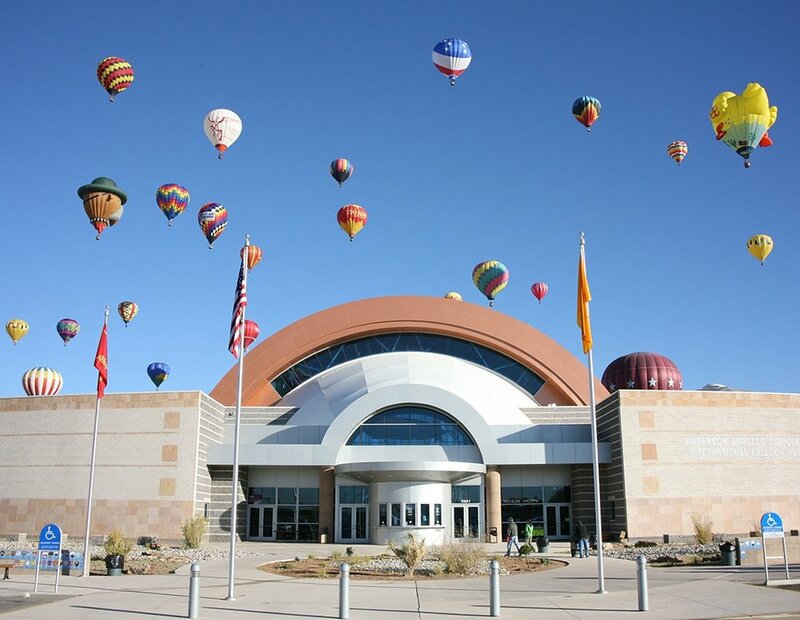 Middleton, WI (13 December 2017) – The Anderson Abruzzo Albuquerque International Balloon Museum in Albuquerque showcases the beauty, ingenuity and history of lighter-than-air flight in a building that has become a beloved landmark in its hometown. Thanks to new control products from ETC and their partner Echoflex Solutions they were able to modernize their lighting control, offering a dynamic lighting environment that was also more energy efficient. The Museum doesn’t just house balloons, it also is meant to look like one. Its striking facade is the silhouette of a hot air balloon, with the top of the building a dome—newly washed with color-changing LED fixtures. The museum wanted to take advantage of capabilities of the LED fixtures and reinforce the iconic nature of the building. The solution was an ETC Paradigm system. Lighting looks were programmed into the system and now the museum staff can choose custom colors for different holidays or special events. The Paradigm system is also a hit inside. The Museum’s event spaces are now easily changeable thanks to Paradigm control and the 7-inch Touchscreen station. Positioned near the ballrooms, the museum can easily shift preset looks in the ballrooms, showcasing the flexibility of the space. Echoflex Solutions technology also helps out in the gathering spaces. Echoflex TAP daylight sensors communicate wirelessly with their dimmers, automatically dimming lights to conserve energy and ensuring a space is always lit correctly. High-ceilinged event spaces are well-served by MOS high-ceiling occupancy sensors. The sensors charge via solar energy, so batteries never need replacing, and the excellent transmission range, along with tuned-sensor circuitry mean the lights quickly come on when needed. ETC and their partner made a big impact on the museum’s exhibit spaces as well. The museum’s Great Hall hall is enormous — it has to be in order to house balloon artifacts and models of gigantic zeppelins. While the lighting for these exhibits was simple, turning it on was anything but. Fixing the problem was complicated by the fact the large exhibit halls and soaring ceilings necessary for the exhibits made re-wiring the museum cost prohibitive. The museum also wanted to upgrade the lighting controls in their event spaces. With the purchase of LEDs for the space, the Museum felt they could realize even more energy efficiency, but had no infrastructure to install remote sensors and controls. The solution to both problems was wireless power control solutions from Echoflex Solutions. Self-powered, wireless wall switches from Echoflex gave the museum the flexibility to place control where they needed it and had the power to cover their large spaces. Other wireless control products only send signal 70 feet — hardly enough for the Museum. Echoflex Solutions products have a much longer communication range, and can send signals up to 300 feet. The Echoflex products integrate seamlessly with ETC’s Paradigm system, so scheduling the exhibits to automatically power on and off was a breeze. And the exhibits are, ultimately, what the museum is all about. “Museums are educational and engaging venues,” says Garver. “We’re always looking for creative ways to get people involved and connected to us, lighting is one way to do that.” Now, thanks to ETC and Echoflex Solutions, it’s easier than ever for the museum to take its patrons to new heights.